McKinney is known throughout Texas for its historic downtown square but it also gaining notoriety around the state as one of its healthiest cities. The city’s mixture of natural settings, wide variety of fitness options and growing foodie movement combine to give residents and visitors alike plenty of healthy choices within McKinney’s borders. Leading the charge is the city’s mayor, Brian Loughmiller, who competes in triathlons, marathons and other races including the Hotter Than Hell 100-mile bike race and Ironman competitions. He is also heavily involved in the American Cancer Society’s Relay for Life; McKinney has one of the largest RFL events in the state. Mayor Loughmiller has become such a positive role model to residents, as well as visitors who come to the city to participate in races, to walk the nature trails and enjoy all the fitness activities available to all. McKinney, which has consistently ranked among the nation’s fastest growing cities since over the past decade, draws families looking for a sense of community and positive quality of life. Nothing improves quality of life like participating in healthy activity while enjoying the beautiful outdoor settings McKinney offers. The county seat of Collin County, which covers almost 63 square miles of North Texas just 30 miles north of Dallas, is filled with city parks, wide open spaces, and nature trail areas all begging to be explored. Whether conquering the rugged off-road bike trails at Erwin Park or walking and riding the many miles of connected hike and bike trails that wind throughout the city, residents and visitors always have a place open to them to enjoy the nature around them right within the city. Sports competitions bring many visitors to McKinney to take advantage of the top-notch baseball, softball, soccer, sand volleyball, ice skating and tennis facilities found mostly in the city’s southwestern quadrant known as the Craig Ranch Development. Many of these facilities are also open to the public while others are primarily reserved for organized sports tournaments. The most recently opened of these facilities are The Courts offering 11 lighted tennis courts and a 3,500 square foot Clubhouse where the public can participate in year-round leagues and private instruction, as well as renting the courts for personal use. The tennis complex opened in early 2012 and that summer, was named 2012 USTA Facility of the Year. Another much-anticipated venue that opened mid-2013 next door to the tennis complex is the Skatepark at Gabe Nesbitt Community Park. The skatepark, which is open to skateboarders, scooters, and inline skaters, offers elements for all skill levels, including street elements, stairs, rails, and three bowls, more than 30,000 square feet of concrete and shaded seating for spectators. The city has a wide range of fitness-friendly venues, so why not host fitness-focused events at these venues? McKinney organizations do this with gusto. From 1Ks to half-marathons, 1 mile fun runs to triathlons, and even a high-speed closed-criterian bike race through the streets of historic downtown McKinney, the city brings people from all around the state (and neighboring states, too) to join in the community spirit of fitness and healthy living. Walkers and runners get their start in January with foot races being held on practically a monthly basis and sometimes more often, the majority of which help favorite local and county charities such as ManeGait Therapeutic Horsemanship ranch, Habitat for Humanity, Relay for Life, Especially Needed (for special needs children), American Alzheimer’s Association, Love Life Foundation and more. Races like the Cupid 5K Couples Race, Leaping Leprechauns, Night Moves 5K, Historic McKinney Kiwanis Triathlon, Melon Dash 5K, Believe McKinney 1 Mile, 5K and 10K, Walk to End Alzheimers and more bring thousands of people throughout the year to locations like downtown McKinney, Craig Ranch, Stonebridge Ranch, Adriatica, and Myers Park. The largest non-foot race is the Bike the Bricks Closed-Crit race where cyclists race a course made up of streets around the historic downtown square in pursuit of more than $20,000 in prizes. 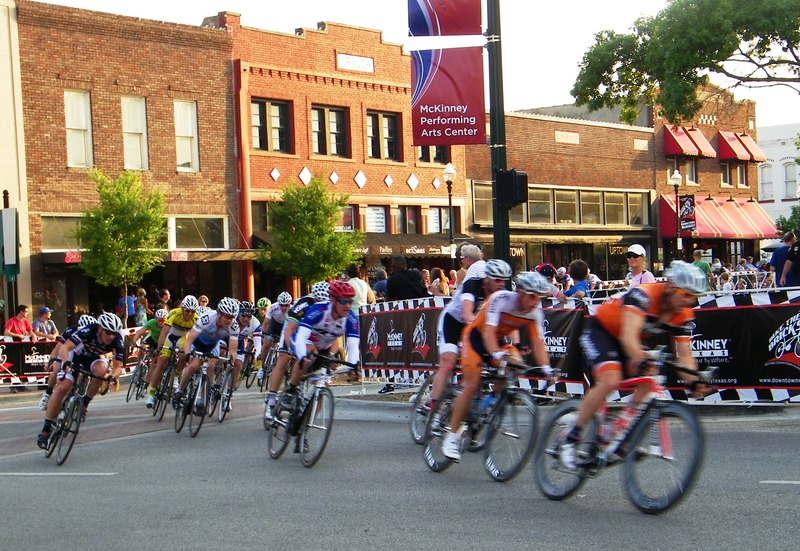 A Friday evening race, usually held around Memorial Day Weekend, attracts spectators to feel the “whoosh” of cyclists whizzing by at speeds topping 35 and 40 MPH. Also, top cyclists from around the country love the challenge and quaint beauty of the downtown square’s race backdrop. All this racing, hiking, biking and skating makes people hungry, so how better to satisfy those hunger pangs with healthy food from McKinney’s Farmers Market at Chestnut Square Historic Village or from one of the eateries offering organic and gluten-free meals and organic meat market that even teaches you how to properly prepare meat. The Farmers Market is held weekly on Saturdays from 8 a.m.-noon from Spring to Fall and monthly through the winter months at Chestnut Square Historic Village and on Thursday afternoons at Adriatica Croatian Village in Stonebridge Ranch. Here, visitors and residents find a wide variety of produce, dairy items, bakery products, meat, herbs, olive oils and even soaps and cereal. The market received top rankings as the Best Farmers Market for its size in the state and in the Top 5 nationally. Being located an easy few block walk from the historic downtown square makes it a must-visit when exploring the square on a Saturday “in season”. Diners can also enjoy organic and locally-grown products at several of the downtown restaurants, including Patina Green, Rick’s Chophouse, Square Burger, and The Pantry, many of which are provided by the Farmers Market vendors. The meat products come from Local Yocal Farm-to-Market and Hamm’s. Local Yocal even holds Steak 101 classes on Saturdays that allow attendees to learn about beef grading, cuts and even proper grilling methods. (Big bonus for beef lovers: The third portion of the class includes getting to sample a wide range of meat cuts grilled specifically for you as you watch and ask questions. Health and fitness-conscious visitors looking for a getaway weekend will find all they need for a top-class experience in McKinney, Texas, which has been ranked on Money Magazine’s Top Places to Live in America since 2008. For more information about planning a trip to McKinney, visit the McKinney Convention & Visitors Bureau website, VisitMcKinney.com, or call 888-649-8499. About McKinney, TX: Located just 30 miles north of Dallas, McKinney offers visitors the perfect getaway destination, with its tree-lined streets, historic downtown and tight-knit community giving this fast-growing city a friendly, small-town feel despite the city’s population which topped 149,000 in January 2014. Discover McKinney and find out why we truly are unique by nature! Great post! Thank you for sharing this information. I’m a new chiropractor in McKinney. My wife and I just moved here from Italy and we are excited to discover more and get involved in the McKinney community.